Does a hulking, hairy, 800-pound, nine-foot-tall, elusive primate roam the woods and forests throughout North America—and the world? What should we make of the grainy videos and photos and the thousands of eyewitness reports? Audio-recordings exist purporting to be the creatures’ eerie chatter and bone-chilling screaming. Whether called Sasquatch, Yeti, Bigfoot, or something else, bipedal primates appear in folklore, legends, and eyewitness accounts in every state of the union and many places around the world. The fascination with the man-beast is stronger than ever in today’s pop culture. Documenting the facts, hearing witnesses out, and scrutinizing the evidence, The Bigfoot Book investigates the reality, the fiction, and the history, as well as the conspiracy theories, notorious frauds, the world of the supernatural, the television shows, movies, and literature, and everything to do with the celebrated ape-like creature. With nearly 200 entries and 120 photographs, drawings, and illustrations, it covers 400 years of folklore, mythology, history, pop culture, scientific reports and findings, and much, much more. It covers everything from the Abominable Snowman to Zoological Society Revelations. This richly researched reference, overflowing with fascinating information, will make you think—and maybe even reconsider your next camping trip. 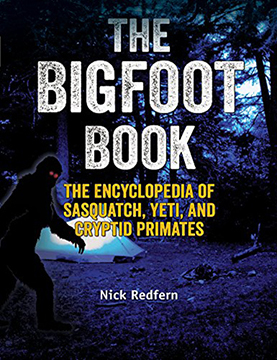 THE BIGFOOT BOOK: The Encyclopedia of Sasquatch, Yeti, and Cryptid Primates By Nick Redfern 400 pages. 8x10 Paperback. Illustrated. Index.